Phoenix Challenge Coins is aiming to “up the game” of the challenge coin industry with Coin Armor™ and Armor Shield™, two proprietary technologies that make it possible to create complex design concepts in ways which previously were impossible to accomplish. “We’re different because we care about what we make. We understand the importance of the pieces, the tradition, and what it means to the clients,” Richards said. 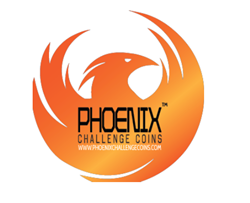 (PRWEB) November 11, 2014 -- Adding to its legacy of innovation and quality craftsmanship, Phoenix Challenge Coins today announces the introduction of Coin Armor™ and Armor Shield™ technology. Phoenix Challenge Coins is aiming to “up the game” of the challenge coin industry with Coin Armor™ and Armor Shield™, two proprietary technologies that make it possible to create complex design concepts in ways which previously were impossible to accomplish. Challenge Coin Armor™ and Armor Shield™ also create stronger, more durable finishes for coins that can stand up the the everyday carry use in the tradition of a challenge coin. Challenge Coin Armor™ and Armor Shield™ provide major scratch resistance, corrosion and tarnish resistance and can withstand more wear and tear damage than any custom challenge coin that is currently available on the market. Multi-generational use is important to challenge coin recipients, Richards said. A challenge coin is a well known symbol in the military world — a tangible memento meant to convey strength, honor and brotherhood. Challenge coins have a rich history, providing more than just a physical token, but conveying a deep meaning that is meant to resonate, and to be remembered. Phoenix Challenge Coins has taken that rich history and meaning, combined it with cutting-edge technology and sheer artistry to create modern challenge coins that are beyond compare to virtually any other challenge coin on the market. Each of the thousands of stunning custom challenge coins created by Richards is expertly designed and hand-crafted with precise skill, technique and technology. Richards, a military and challenge coin aficionado, practices his craft with the utmost attention to detail, devoting his professional life to fine-tuning and perfecting the challenge coins that mean so much to the recipients and their families. From soldiers returning home after a long deployment to raising funds to support families of the military’s fallen heroes, to the firefighters and police officers who protect us in our own communities — a challenge coin can mean so much to so many, Richards said. With the addition of the new Coin Armor™ and Armor Shield™ technology, Phoenix Challenge Coins is able to create historical coins that will stand the test of time — and maintain their integrity for generations to come.